Their grandmother's stone cottage was always a welcome retreat in the childhood summers of Ellen and Aidan O'Shea. After a trip home from Australia, Ellen is keen to bring the neglected home back to its former glory and enlists the help of her dear friend and one of Ireland's top interior designers, Colette Barry. I read MS Campion’s debut book Leaving Ocean Road and was left gobsmacked by how good it was, and then I picked this one up and just felt so good, it was like being back with family and friends, Gerry and Ellen and now we get to see Aiden and Collette come together in a heart-warming and poignant story that had me turning the pages and feeling so close to all of the wonderful characters, sit back and enjoy this one as I did on a journey to love, that is helped along by a house. Ellen and Aiden have decided to renovate their grandmother’s home in West Cork on the coast Ireland, a beautiful setting a lovely old house that needs a lot of work, Ellen has hopes of turning it into B&B or a place people can stay to get their lives back on track. Aiden is not so convinced in the beginning and is not happy when Ellen requests her best friend Collette to step in and help with the interior designing, but Aiden has memories from this house that have caused him heartaches over the years, is it time to open up and let them go. Collette Barry a former teacher now one of Ireland’s top interior designers and divorced is living at home with her Mum, she works hard and is excited when her best friend Ellen asks her to help bring back to life her grandmother’s house, but she seems to meet a brick wall when she meets up with Ellen’s brother and the builder Aiden. Never one to give up after what she has been through she is drawn to Aiden and when there is heartbreak with a child this brings them closer together and working on the house starts to make her open up. I loved this story in so many ways, there are beautiful emotions flowing on the pages, such awesome characters that add so much to Aiden and Collette’s touching journey. MS Campion is an amazing story teller who gets to the heart of people and brings them to life, for the thorough enjoyment of readers, I loved the settings as we do a bit of travelling from Australia to Ireland. This is a story that I highly recommend, there were tears and happy sighs because Aiden and Colette so deserved love and happiness they are beautiful people, thank you MS Campion for another keeper. 5.0 out of 5 starsAn excellent sequel to Leaving Ocean Road! 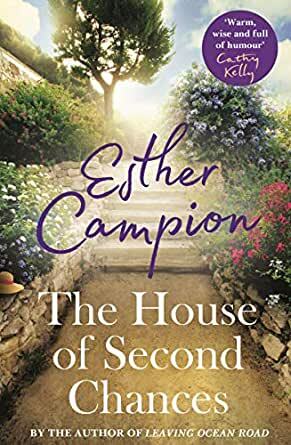 The House of Second Chances by Aussie author Esther Campion is the sequel to Leaving Ocean Road, and it was wonderful to catch up with Ellen, Aidan and Gerry once again. The story continues on from the ending of Leaving Ocean Road and was exceptionally well done, with the blending of known characters with new ones. The parts of Australia in the novel – Port Lincoln, Millicent, Mount Gambier, the Coorong – are places I know (I lived in Mount Gambier as a child); while Ireland is a place I haven’t been, but the descriptions of the countryside were delightful. I thoroughly enjoyed the novel and whipped through it in a matter of hours (who needs sleep?!) Highly recommended.